Mulyichoice Nigeria has officially splashed the New year 2017 with a drop in subscription rate of DSTV and GOTV. These development is aimed to encourage users to upgrade to their packages and get more benefit attachde to it. The Promo was tagged #DStvStepUpBoost and #GOtvTopUp. 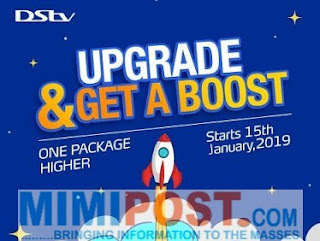 The promo will run for three months starting from January 15th to April 15th, 2019, it will give all active and disconnected DStv Compact, Family and Access customers the opportunity to pay for an upgrade package and get a boost to view programs in the higher package within 48 hours. The offer allows DStv customers on the Access package to pay N4,000 for Family package and get a boost to view programs on the Compact package, while customers on the Family package can pay N6,800 for Compact package and view Compact Plus package programs. Also, Compact customers can also pay N10,650 for Compact Plus package and in turn get Premium package programs. Also, customers on GOtvPlus, Value and Lite will get upgraded to GOtv Max when they pay a reduced fee of N2, 500, while GOtv ‘tops up’ with N700. 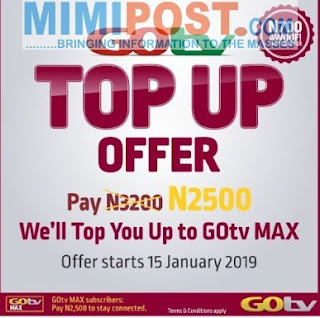 Active and disconnected GOtv Max customers can also take advantage of this limited time offer to renew their subscription for N2, 500. The promo is also positioned to give GOtv customers on Plus, Value, and Lite an opportunity to experience the exciting premium content available on GOtv Max including La Liga, Serie A, FA Cup, BET, Fox Entertainment, StarLife, ROK 2 and CBS Reality and more. The offer reiterates the company’s commitment to give more value for money to the company’s loyal customers. Mabutho noted that the offer will enable more Nigerians to stay connected and keep up to date with the latest news, sports, local content and general entertainment this first quarter. However, the #DStvStepUpBoost offer is not applicable to the Premium package; but Multichoice said they have something awesome in the pipeline for Premium and Compact Plus customers.